What is the Egyptian Game SENET? name Amenhotep III possibly from his tomb. Games are popular today, but what about back in Ancient Egypt? People sometimes assume humans were super serious in the past. I'm not sure why this is the case. There's nothing to suggest this is true. In fact, Ancient Egyptians loved parties, dancing, music, and games. What was Ancient Egypt's most popular board game? Senet was a popular way to pass the time. People kept boards in their homes. Even Egypt's pharaohs were known to play. Rich people had fancy boards made of materials such as jade and ivory. 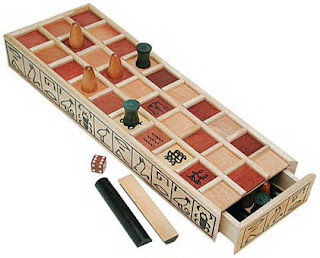 Regular Egyptians played Senet, too. Boards could be made of wood or drawn on a sheet of papyrus that could be rolled up and put away. Here's a fun fact: makeshift Senet boards were actually carved right into the stone pavement! That way, people could challenge one another to a game outside. Other players might draw Senet boards in the sand along the banks of the Nile the way you draw a hopscotch board with chalk. Some might have drawn Senet boards in the dirt outside their homes. Senet boards contain 30 squares laid out in rows of 10. Each player has 5 pieces. Players throw sticks or sheep's knucklebones to determine how many spaces to move. Wealthy Egyptians used a piece of carved ivory or other precious material shaped to look like a sheep's knucklebone. One side of each throwing stick is painted black. The number of black sides you roll determines the number of spaces you can move. Players move their pieces down ten squares, turn the corner, complete the thirty squares and remove the piece from the board. Players keep moving their pieces in this manner until all pieces have been removed from the board. DID YOU KNOW SOME CONSIDERED SENET A GAME OF LIFE AND DEATH? Originally, Senet was played for fun to pass the time. But as the game became more popular, it took on a more serious tone. Ancient Egyptians believed that winning a game in the Afterlife could help them when they were dead! 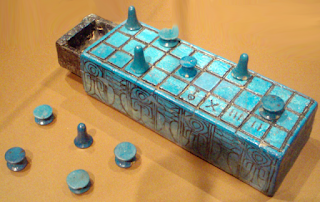 Therefore, the board game was included in tombs so that the deceased could play for all eternity. Maybe that's why Senet became so popular with the living. Everyone was practicing their Senet skills before it was too late! 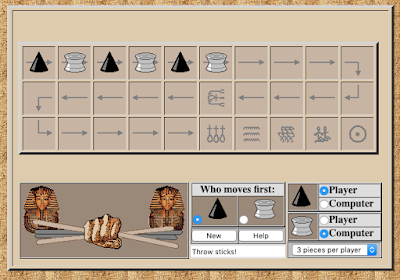 Click here to play the game of Senet right in your browser. Did kids have toys in ancient Egypt?